StimulantsTrec Caffeine 200 Plus - 60 kaps. Trec Caffeine 200 Plus - 60 kaps. A unique product that stimulates the organism to increased physical and mental activity. It is not only the advantages of using this supplement. Interesting addition in the form of naryngeniny further extends the time in which you will feel the stimulation. 20 loyalty points Your cart will total 20 points that can be converted into a voucher of 0,80 PLN. TREC Caffeine 200 MAX contains ultra-pure anhydrous caffeine and strengthening its operation naryngeninę. The product extremely quickly stimulates the organism to increased physical and mental activity. Caffeine not only stimulates the central nervous system, but also helps to overcome fatigue and training stagnation. This active alkaloid reduces the decomposition of glycogen and increases the metabolism of fat, which increases pools necessary for really heavy exercise power. Appendix naryngeniny enhances the effect of caffeine and prolongs its activity in the body. TREC Caffeine 200 MAX is an exceptional product which stimulates the organism to increased physical and mental activity. Its formula uses the synergy of mutual action of the highest quality anhydrous caffeine and highly concentrated naryngeniny originating from standardized extract of fruits of grapefruit (Citrus paradisi). The addition of active polyphenols maximizes the potential hidden in caffeine. This allows Caffeine 200 MAX more effectively supports the body during the execution of really hard work. The product promotes alertness and concentration, reduces fatigue and increases motivation for intense workouts. 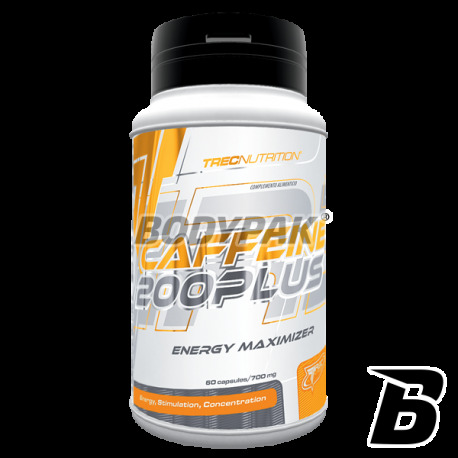 TREC Caffeine 200 MAX is not only a powerful stimulant, but also a product with an extremely high potential energetic, which increases the efficiency of the body during intense aerobic and anaerobic efforts. Use of Caffeine 200 MAX contributes to improved exercise potential in hard-training strength athletes, endurance athletes, and endurance. Caffeine (1,3,7-trimetyloksantyna) belongs to a group of xanthine - commonly found in food alkaloids. People for years use its positive stimulant, consuming large amounts of stimulants (coffee, cola, tea). Unfortunately their regular use is associated with unpleasant occurrence of adverse effects, mainly gastrointestinal. Natural sources of caffeine frequently contain many ingredients that weaken its absorption and positive effects on the body. The concentration of the pure alkaloid in them is relatively small, so we are forced to use large quantities. Together with them we introduced into the variety of side effects of irritant substances. Only the use of caffeine in the form of non ensures maximum utilization of its potential without unpleasant side effects. The best supplementation and purest form of this alkaloid is caffeine anhydrous. It is completely free of impurities and additional crystalline and chemically-pure form of caffeine, which is well absorbed and rapidly stimulates the body to intensive work. Numerous scientific studies conducted with athletes of various sports indicate that the effective dose of caffeine leads to improving the exercise is between 3-6 mg / kg body weight. Interestingly, even a similar amount of this alkaloid drugs from the following example. Maker operates less than pure form. That's why the TREC Caffeine 200 MAX contains up to 200 mg of the highest quality caffeine in a completely anhydrous form. The supplement of naryngeninę to mobilize all the forces of your body and provide you with maximum motivation for exercise. Caffeine Anhydrous is quickly intercepted by the gastrointestinal tract and, along with the bloodstream quickly reaches the nervous system. Then penetrates the blood / brain barrier, and use of its analogy in the structure to adenosine are bonded to the specific receptors on neuronal membranes by blocking them permanently. Since adenosine transfers in the brain signal the body's fatigue, caffeine blocks this transfer and eliminates the first symptoms. With supplementation pure anhydrous caffeine before a workout you can increase their motivation and long dismiss the feeling of physical and mental exhaustion, impeding its continuation. Caffeine enhances the secretion of epinephrine (adrenaline), which stimulates the circulatory and respiratory systems and muscles to more intensive and more efficient work. As a consequence of this hormone in the muscle tissue increases carbohydrate metabolism in adipose tissue and lipolysis (the initial stage of combustion of fat). Caffeine increases so the amount of energy needed, which supplies hard-working muscles. As a result of this action occurs noticeably increased strength, stamina and endurance. It allows you to increase the intensity and effectiveness of exercise and enables faster progress training. The period of activity of caffeine in the body is relatively long, because it affects also positive on the process of post-workout regeneration. Caffeine activating fat metabolism, reduces the breakdown of glycogen, and after exercise speeds up the rebuilding of its reserves (by up to 60%). TREC Caffeine 200 MAX contains a large addition of grapefruit extract standardized to 98% of the content naryngeniny, which increases the effectiveness of caffeine supplementation. This component gives the characteristic bitterness of citrus fruits, but also has other interesting properties. Research has shown that the combined oral supplementation, as a result of specific interactions of metabolic naryngenina increases the level of caffeine in the blood by as much as 28% and prolongs its activity in the body by almost 30%. Additionally it naryngenina works thermogenic and together with caffeine activates fat metabolism, leading to a reduction of subcutaneous inventory and increase the amount of useful energy. TREC Caffeine 200 MAX is an ideal product for active people physically and mentally, which require additional mobilization and stimulation to take up new challenges and intellectual training. This is an excellent and concentrated replacement for stimulants such as coffee, tea or cola, deprived of their typical flaws and irritating properties. The formulation has a strong stimulating energizing and contributes to improving the stress and increase the strength and endurance of the total body. Składniki: maltodekstryny, kofeina bezwodna, otoczka kapsułki (żelatyna, barwnik: dwutlenek tytanu), Ekstrakt grapefruita (Citrus parodisi)(98% naryngeniny), substancja przeciwzbrylająca: sole magnezowe kwasów tłuszczowych. Dobry produkt, w jeszcze lepszej cenie. Działa tak jak powinien, a 60 kapsułek starcza na całkiem długo. Jedna kapsułka przed treningiem po ciężkim dniu w pracy i można na prawdę wiele więcej podczas ciężkiej sesji treningowej! You are an active person and has problems with weakness or stress? The solution is precisely this formulation. It is based only on natural plant extracts that have a significant impact on improving the body's resistance to stress and improve vitality. Top quality at a good price! Gutar is a natural means of improving blood circulation and concentration. enabling faster response. That's why we recommend it in all situations that require high efficiency mental and physical. UNS Caffeine 200 - 100 kaps. The high concentration of caffeine in each capsule! The ideal supplement to the weaker days or during preparation for examinations and tests. It improves concentration and boosts energy! EACH SERVING UP TO 200 mg CAFFEINE! UNS Caffeine 200 - 50 kaps. Amix CoffiTime BOX - 90 kaps. The preparation ensures enormous agitation, whose action is prolonged in time thanks to the synergy of 5 active substances! The perfect choice for the weaker days - both before training and before you start learning! BioTech Power Force - 60 kaps. Excellent source of excitation energy during the day. Effectively improves concentration and memory abilities. Bet on the tested substances in the right proportions! Only the highest quality!